YOU GOING OUT IN THAT? 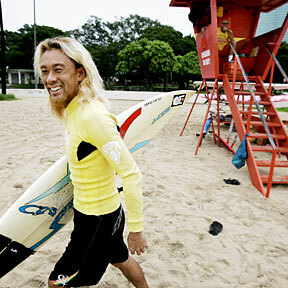 Surfer Shingo Sano, of Osaka, Japan, headed for the ocean at Ala Moana Beach Park yesterday despite being warned of polluted water from the Ala Wai sewage spill by city lifeguard Steve Clendenin, in the lifeguard stand. The Hawaii teen is set for the LPGA Tour's opening major of the season. Some worry about the spill's environmental and tourism effects. Isle entrant's picture with Pillsbury Doughboy is consolation prize. They want to show they've still got what it takes to win in the Kraft Nabisco Championship. The Council defers action on a resolution to stop a hotel and condo development.